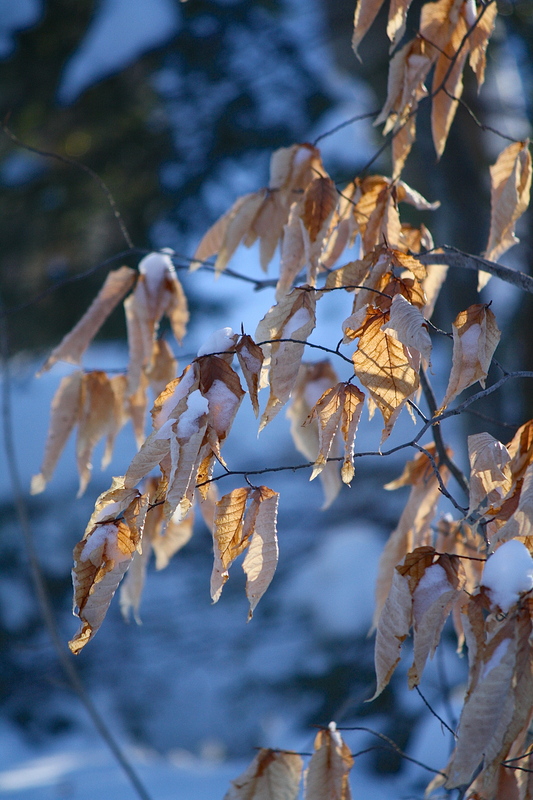 At the end of the day, dried Beech leaves are backlit by the setting sun. American Beech (Fagus grandifolia) leaves persist all winter until they release in the winds of March, just before the new buds of spring unfold. I am thankful for their tenacity, not only as an echoing reminder of the leaves of summer, but also for the gentle, papery rustling they make when the wind blows. Mesmerizing and soothing, they reassure us that life in the forest is only resting. This entry was posted in Field Notes, My Photos and tagged American beech, backlit, dried leaves, Fagus grandifolia, March wind, nature photography, trees, wind, winter, woodland. Bookmark the permalink. Thank you so much, Trini! ❤ 🙂 I will have to give it another listen. Beautiful shot Eliza, the leaves are so lovely and the colours in this image are very pretty. Funnily enough that was pretty much the impression I got from the photo. Oh, Robbie, such sad news. I am sorry to hear it. The heartache is the worst part – saying goodbye, it just plain stinks. Treat yourself kindly over the next few days and savor only the best of your memories. Blessings and hugs. Yes, it is a good metaphor. Chance will take the extra hugs, but there is no replacement of the individual that is gone. She had a good long life with you and that is some comfort I hope. I love the feeling you’ve captured here, Eliza. It’s a kind and gentle optimism. Thanks, Micheal, for the lovely comment. How’s the moving process coming along? Our current house is in escrow. We’ve put in offers on two houses. The sellers picked someone else on both 😦 We’ve been trying to find something built prior to 1940, but in SoCal its tough to find an affordable & nice old house in a nice old neighborhood. Now we’re starting to look at “newer” houses — built in the 60’s and 70’s. We’ve never lived in any house newer than 1927. It’s a big adjustment. Today I looked at a beautiful big house, well maintained, ready to move in. As I drove away I felt a bit depressed. We just looked at props in New England again. What fantastic homes & settings. But if you calculate the price per square foot divided by the number of warm days, the cost is astronomical! Sorry to hear about the offers falling through. Spirit must have something better in mind for you! New England can’t be more expensive than SoCal. Have you thought about renting for a year somewhere you’ve been dreaming about? Yes, Spirit has something better in mind. When I bemoaned the fact that we can’t find a cool old house (we have found exactly two so far), she said that perhaps its time for a change! A thought that didn’t occur to me. She pointed out that we aren’t up to the physical challenges we once could conquer. Yes, we have thought about renting for a year to make sure a new locale is a good fit. One problem is the cats & dogs. And, New England is only expensive from the point of view of someone who counts the cost of not getting to have the windows open 300 days per year. I know that Spirit has our next home prepared. Pretty Eliza. I love the warm and cool colors together. You used the lighting beautifully in your photo…It really creates an engaging image. I love this image. It’s so beautiful, especially the light. I love what you wrote about the leaves, too. I’ve always liked that some trees hang on to their leaves during the winter, and the beech is one of my favorites. Thank you, Robin. The American beech is one of my favorite trees, so graceful.